James Gowans was known for his innovative approach to architecture. Described as the “romantic rationalist”, he designed a number of buildings in Edinburgh during the 1850s and 1860s. His most famous house was Rockville, in Napier Road, which was built for his second wife in 1858. It contained many of his innovative ideas and remained his family house until just before he died. Sadly, it was demolished in 1966. In 1885 he became Dean of Guild and was largely responsible for organising the Edinburgh International Exhibition on The Meadows the following year. Queen Victoria visited the exhibition on 18th August 1886 and knighted James Gowans for his work. A number of memorials survive the exhibition, including the Memorial Masons’ Pillars, which have red, white and yellow sandstone from 17 different quarries, and the 13 foot high Brassfounders’ Column. Both of these were designed by Gowans. The Masons’ Pillars are at the west end of Melville Drive, and the Brassfounders’ Column is now in Nicholson Square gardens. Other surviving works include 23-25 Blacket Place and Lammerburn at 10 Napier Road. 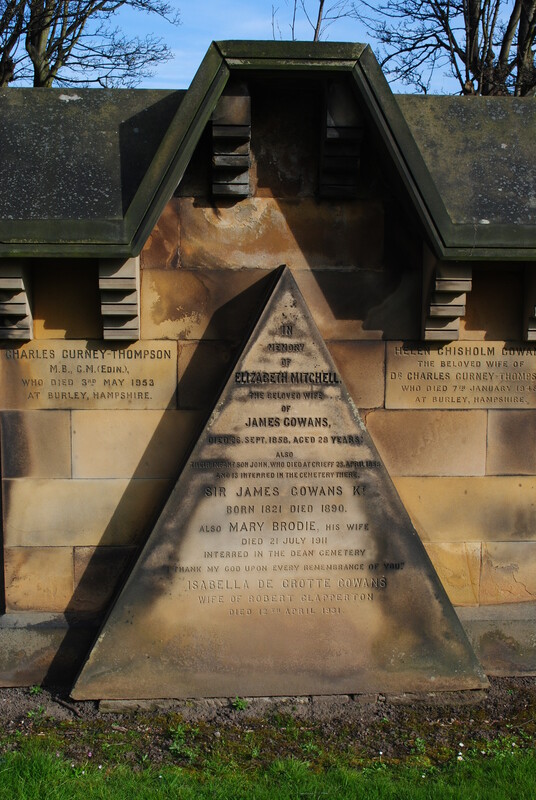 James Gowans was born on 1 August 1821, in Blackness, a small village on the Firth of Forth. He was the son of builder Walter Gowans, and Isabella Grant. He was educated at the Hamilton Place Academy in Stockbridge and trained under David Bryce. His father bought two quarries in 1842, and James worked in the family business. When the family leased Redhall quarry, James began to experiment with unorthodox ways of extracting the stone. He also designed and built Redhall Bank Cottages for the workers at the quarry. He married Elizabeth Mitchell (1830-1858) in 1848. The couple had at least five children before she died in September 1858. She is buried in the Grange Cemetery plot. Their infant son John, who died in Crieff in April 1858, just 5 days old, is also commemorated there. His second wife was Mary Brodie (1842-1911), the daughter of William Brodie who provided the sculptures for the family home at Rockville. They had at least one child, Helen Chisholm Gowans (1868-1948). In 1890 Gowans moved to 1 Blantyre Place, as his financial situation had forced him to sell Rockville. He died there on 25 June. Besides Gowans, the memorial in Grange Cemetery commemorates his wives, his daughter Helen, her husband Charles Gurney-Thompson (1867-1953) and his granddaughter, Isabella De Grotte Gowans (1891-1931).